PILSEN — After years of working in a traditional office at an architecture firm, Chyanne Husar struck out on her own in 2010 to start her own business. Trading the firm's office for a laptop on her couch helped the architect launch a successful business, but Husar soon realized something was missing — community. "I was so used to being in a studio environment where you share ideas and talk through," she said. When Husar decided to move from Logan Square to Pilsen earlier this year, she made a bold decision. Husar wouldn't just be moving in, she would open a co-working space in the building, too. The result is husART Design Collective, a cozy co-working space at 1800 W. 21st St. in Pilsen that opened last month. The shared office will also function as an art gallery and event space and offer a conference room for rent to startups, she said. Husar, who owns husARchitecture, said her goal was to attract other artists, creators and small business owners to work together and foster inspiration. She aims to attract six like-minded workers who would use the space under full-time memberships and about five people who would need space part time. "Just having people to talk to, even if it's not about what you're working on specifically, it really helps your creative juices flow," Husar said at the studio Wednesday. Monthly memberships at husART Design Collective are about $300 and include a dedicated workspace with a chair, desk, filing cabinet, free coffee, open access to other work spaces, key privileges, access to future phone booths and the chance "to build a community," Husar said. A 10-day "punch card" pass at is $100 and includes the desk space, coffee and community, she said. Chyanne Husar wants to build a community of like-minded creative people and small business owners at husART Design Collective, the co-working space she recently opened in Pilsen. The environment is pet-friendly, too, Husar said. 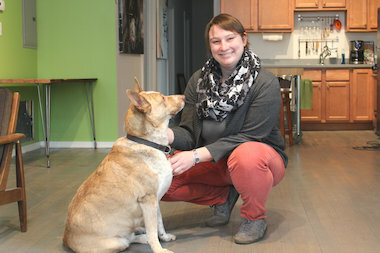 Her husky-Australian Shepherd mix Huxley often keeps her company during the workday, she said. To raise money for furniture, technology and program funding, 33-year-old Husar has launched an online fundraising campaign, with a goal of raising $8,000 for the collective. With that money, Husar hopes to add more furniture, outfit the conference room with a projector and white boards, add printing capabilities and phone booths, start an event series and fund artist residency programs. As part of the event series, husART Design Collective has hosted yoga classes, launched an art series and will host the "She is ..." Holiday Bazaar from noon to 5 p.m. Sunday. Hosted by Jackie Brown, the pop-up shop aims to promote local female artists and their crafts. The events are open to the public. "This is not just about the people sitting here and working, this hopefully reaches out to the greater world to build a community," Husar said. 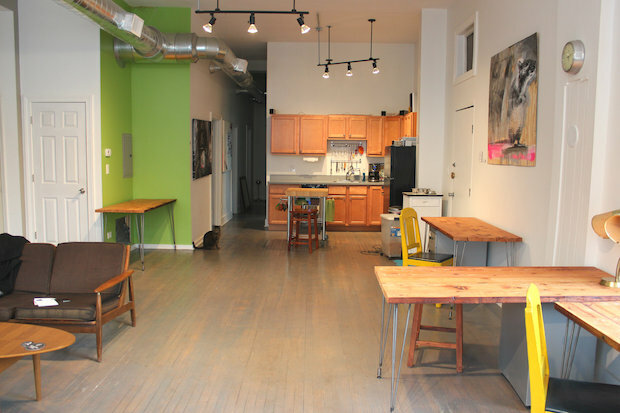 Want to see more of the new Pilsen co-working space? Click through our slideshow.